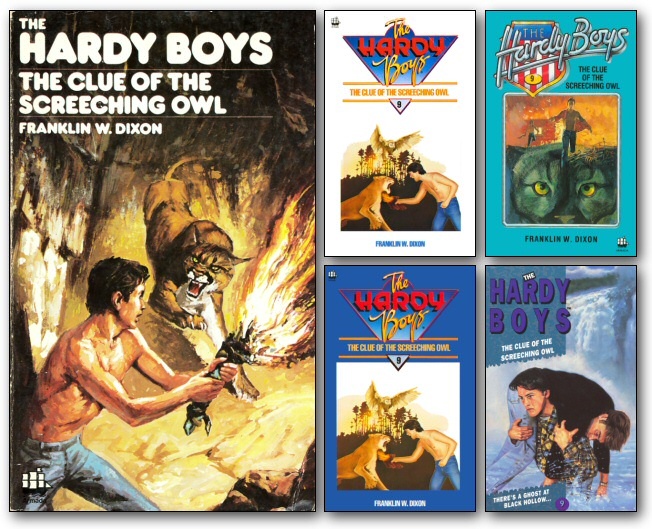 The publishing history of the British Hardy Boys paperback editions is very complex. Given the apparent randomness in which the books were published by Armada, it has proved especially difficult to determine exactly how many titles were released in any given format. HarperCollins Publishers (as Collins became known in 1990) was unable (or unwilling?) to reply to requests for information about the range. Many titles were reprinted in the same Format more than once – some even as many as four times – however, we have not even attempted to catalogue all of the reprints in the same cover format. The following guide is therefore very much based on what information has been obtained through other means. For what started out as a small one man publishing imprint, Armada Books has a fascinating and somewhat complex story behind it. 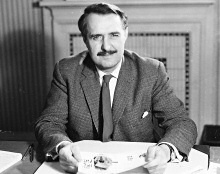 In the late 1950s, writer and publisher Gordon Landsborough (1913-1983) left his job to set up his own publishing company. 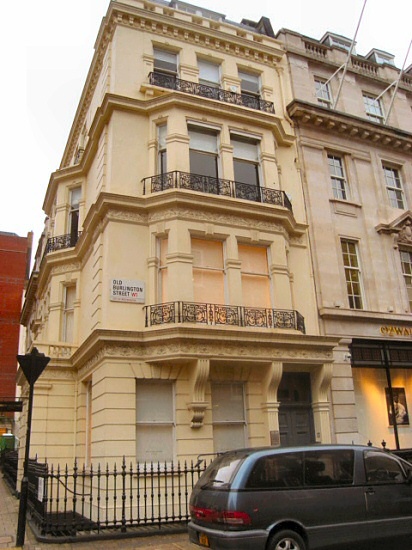 He created May Fair Books Ltd, named after the central west London district where his offices were located (the initial address was 39 Upper Brook Street, London, then from 1963 until 1966 at Dorset House, 13a Old Burlington Street, London). The paperback imprint of May Fair Books Ltd was named Armada. The imprint was designed exclusively for children with pocket money as at the time no major publisher catered solely for the lucrative post-war baby-boomer juvenile market. Armada's distinctive logo was that of a black silhouetted Spanish Galleon, with the legend �PAPERBACKS for Boys and Girls� beneath it. The first titles under the Armada banner were published in 1962 (the official launch of the imprint took place on the Cutty Sark in Greenwich, London). Armada reprinted in paperback successful titles that had previously only been available in hardback, such as the Enid Blyton mysteries, Billy Bunter, and Biggles, as well as new tie-in novels based on then-popular television series such as Bonanza, Stingray, Thunderbirds, and Doctor Who. After several successful years, Landsborough found himself facing difficulties with distribution. Often seen as an interloper in what was predominantly a very snobbish industry that frowned upon and considered cheap mass-marketed paperbacks as being for the poor and common people, Landsborough found it difficult to maintain a presence in an ever-changing market. As a result, he was forced to sell a majority share of May Fair Books to his biggest printer-creditor, Love & Malcomson Ltd (who were based at Brighton Road, Redhill, Surrey) sometime in mid-1966. Within a few short months, Love & Malcomson on-sold its shares to another publisher with whom they had a printing contract. The name of the publisher? William Collins Sons & Company Limited. 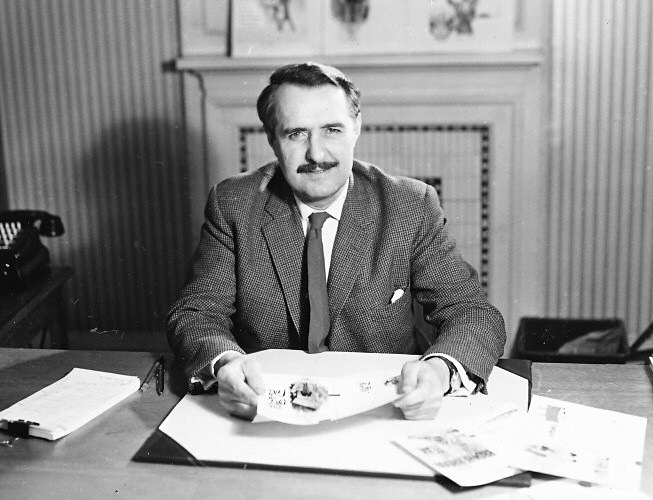 LEFT: Gordon Landsborough in his office at May Fair Books, circa 1961. RIGHT: The original and post-1970 Armada logos. 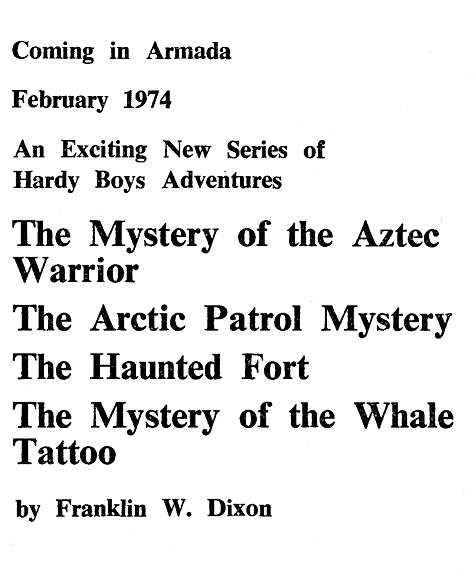 And it was under the rebranded Armada imprint that the Hardy Boys were published in paperback, three years after the initial batch of hardback editions went on sale (and by which time there were already 30 hardback titles in print). 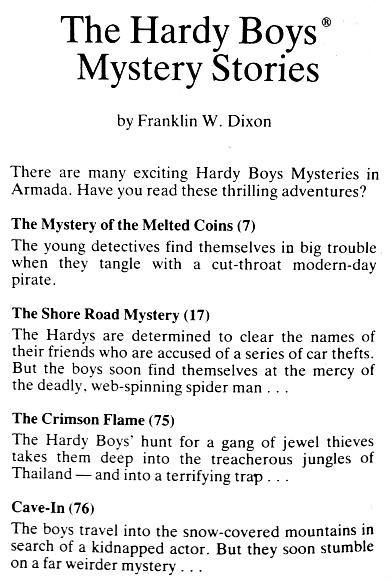 The first batch of four stories were advertised in other books (such as The Three Investigators) in late 1973 and actually released in February 1974. 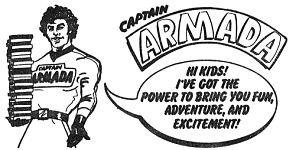 Armada advertisements from the 1970s and 1980s. Although he had retained a minority interest in May Fair Books and Armada under Collins’ ownership, Landsborough had little to do with the day to day running of either range. Soon after the 1966 sale to Love & Malcomson he established another publishing entity called Atlantic Book Publishing Company Limited, with its exclusive childrens' paperback imprint called Dragon Books. This new publishing venture continued for many successful years. Dragon Books was later acquired by Granada Publishing Limited. 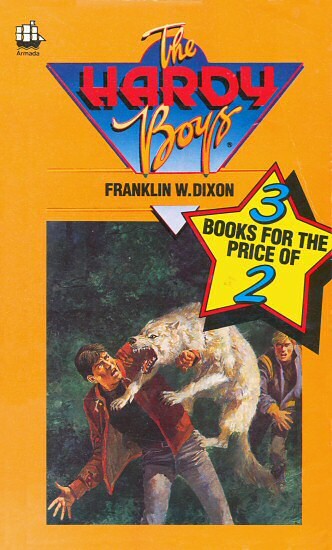 (In an ironic twist, Granada itself was later acquired by William Collins Sons and Company Ltd in 1983, who published a couple of Hardy Boys titles under the Dragon Books imprint!) Landsborough died in 1983 aged 70. 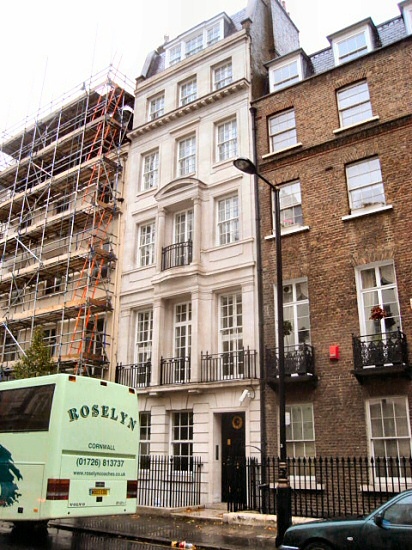 Love and Malcomson Ltd was dissolved in September 1993. (A full and detailed biography of Gordon Landsborough written by his daughter Diana can be found on Wikipedia). As well as the Nancy Drew titles published simultaneously with the Hardy Boys, Armada also published two other Stratemeyer Syndicate girls' mystery series in paperback: Kay Tracy from 1983-1985 (7 titles), and Linda Craig from 1982-1984 (10 titles). Circa 1987/1988, around the time of the News International buy-out, the Fontana Paperbacks division was renamed the Children's Division, then in 1992 it became HarperCollins Children's Books. After having existed for a period spanning some 33 years, the Armada imprint came to an end in late 1995. Original Series (87 titles) – Available in six different cover formats. Miscellaneous (10 titles) – Meet Dracula TV novelization, Ghost Stories, Supersleuths, Survival Handbook and 6 titles in the Be-A-Detective mini-series. The books were printed by a variety of different companies. Love & Malcomson Ltd were the prime producers of the paperbacks up until 1981, when Anchor Press Ltd, Tiptree, Essex (later Anchor Brendon Ltd) took over. From the mid-1980s until the demise of the imprint ten years later, the Armada paperbacks were printed in-house at the Collins production plant in Bishopbriggs, Glasgow. Interestingly, some printings from 1985 were actually printed in France, and carry a line on their copyright pages to that effect (IMPRIME EN FRANCE). During the period in which these stories were published by Armada, the books possessed a number of different cover designs (or formats), which we have labelled using a simple alphabetic system ('A' through to 'F'). Titles not from the original series (i.e., Supersleuths) do not fall under this system. Representative examples of each of the six different Armada cover formats. 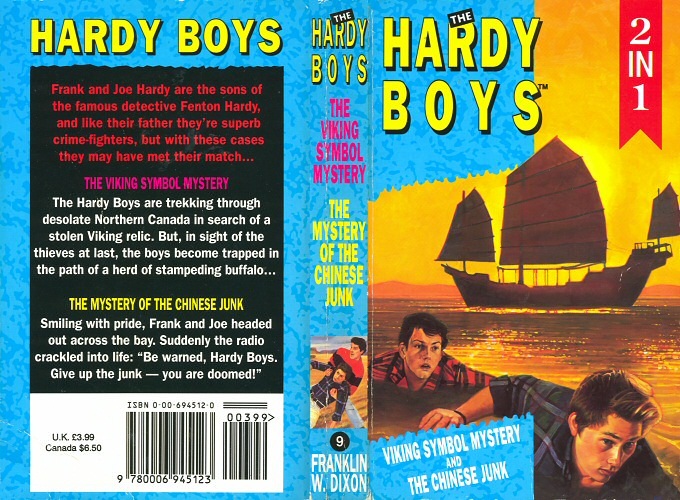 The existing type-plates from the Collins hardbacks (volumes #1-48) were used for the equivalent paperbacks, from the contents pages onwards. The title pages were different from the hardback versions – and in many cases – the frontispiece was repositioned (or in some cases removed altogether!). When it came to volumes #49-56, which were taken from the American Grosset & Dunlap Picture Cover editions, the books had to be typeset again from scratch, and as such there are no frontispieces or internal illustrations in those eight paperbacks. For volumes #57-83, Armada simply recycled the US printing plates, in much the same way as Angus & Robertson had done for their editions. However, that same approach was not utilised for the last four volumes (#84-87) which were completely reset. 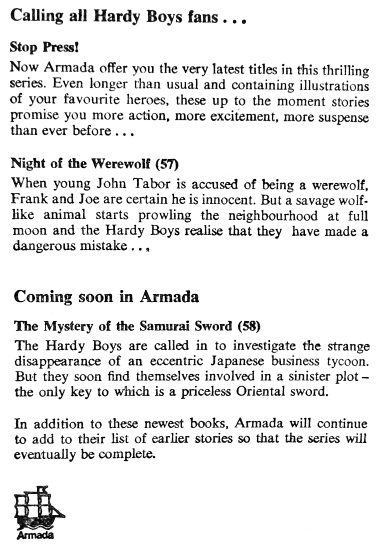 The fact that volumes 49-56 had to be typeset from scratch obviously meant a considerable delay in those titles appearing in paperback. of note, due to inconsistent editing and proof-reading of these particular volumes an occasional anomaly crops up: in some books the 'previous book' and 'next book' reflected the US order (with The Tower Treasure named as the first adventure) while in others the UK order is noted (with The Mystery of the Aztec Warrior named as the first)! The order in which the books were published in paperback was variable. Volumes #1-9 were published first, followed by #11, #19-26, then #12. The numbers then continued to jump back and forth on a seemingly random basis, until all 83 hardback titles had been published in paperback form. The reason for the big jump from #29 to #57 in 1981 was for contractual reasons between Armada and Angus & Robertson; Armada was contractually obligated to publish the more recent titles first. Volume #5 The Mystery of the Disappearing Floor publication delayed due to problems with the cover artwork. Volume #10 While the Clock Ticked only first edition in Format F.
Volume #14 The Secret of Pirates’ Hill first with number on spine. Volume #29 The Hooded Hawk Mystery first with altered Format A logo. 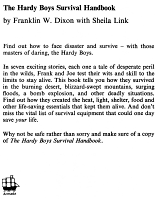 Some changes were made to the paperback titles, with #5 being renamed The Mystery of the Disappearing Floor; #7 is The Mystery of the Melted Coins; #32 became The Mystery of the Missing Friends (on account of "Chums" being considered to be an Americanism not readily familiar by anyone outside the US); and #72 became The Tic-Tac Terror. The Short Wave Mystery lost its hyphen while Programme For Destruction was an Anglicised version of the US title. 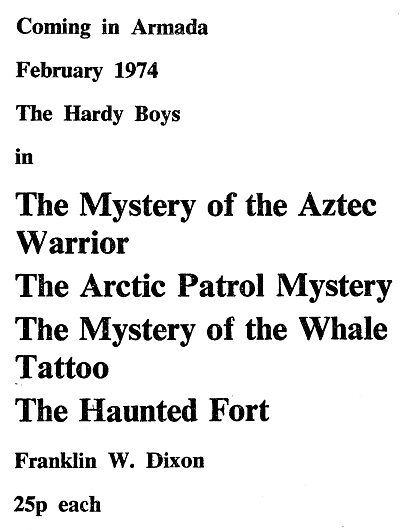 Other titles had an extra "The" added to them, such as The Mystery of the Whale Tattoo, The Mystery of the Desert Giant, The Mystery of the Flying Express, The Mystery of the Samurai Sword and The Mystery of Smugglers Cove. The Armada paperbacks were each reprinted a number of times over the years; for example, the first nine Format A titles were reprinted at least nine times between 1974 and 1983, which is at least once every year. It is outside the scope of this guide to detail every single one of these reprints, as often the distinction between one volume and the next would be nothing more than simply an increase in the prices printed on the back cover. A selection of Armada advertisements promoting the series. 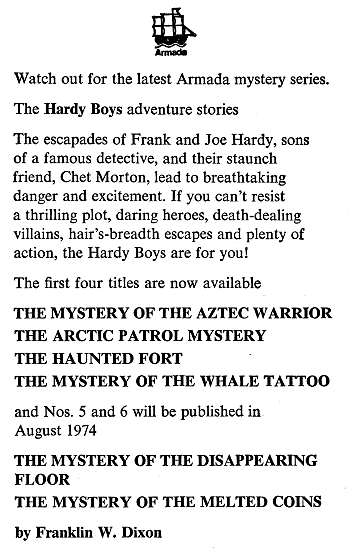 Of particular interest are the following three adverts, the first of which is a notice announcing the imminent arrival of the Hardy Boys in paperback. This made an appearance in several Armada titles in 1973 (including entries in The Three Investigators, Biggles and Nancy Drew series). An alternate version of this advert also exists. The second advertisement (from Spring 1974) is worthy of note, as the intended publication of Disappearing Floor in August was, in the event, delayed until the end of the year, presumably due to the loss of the original Collins cover artwork (more on this here). Also, Melted Coins is erroneously listed here as the sixth entry in the series. The "Stop Press" notice appeared in 1981. It makes a rather ambiguous statement about the Angus & Robertson–derived titles, stating that they were "longer than usual". This was certainly true as far as the page count for these releases was concerned, but that was solely attributable to their utilisation of the American printing plates, as opposed to any genuine difference in story length. With the introduction of the Format B and Format C covers in the mid-1980s, at least 21 earlier titles were issued with new ISBN codes. It is not readily clear as to why this was done, as new ISBNs are usually only adopted when a book is modified in some way other than just a new cover design. The known books with new ISBNs are volumes 1, 5, 7, 8, 9, 10, 12, 13, 17, 18, 19, 20, 21, 22, 23, 24, 25, 26, 27, 29, 30. Examples of reverse cover prices. In addition to the British decimal price, the Armada paperbacks usually (but not always) carried the prices for New Zealand and Australia on their reverse covers, often with the Recommend but not obligatory footnote. In mid-1986, 10% GST (Goods and Services Tax) was introduced in New Zealand, and subsequently increased to 12.5% in 1989. Many later books accordingly include a "(incl GST)" note with the NZ price. Curiously, although Canada was ostensibly served by the US editions, a Canadian price appears on a number of early paperbacks printed in 1974 and 1975 (we have records of at least 14 such titles). However, this was quickly replaced with the familiar "Not For Sale in Canada" notice. Nonetheless, some later isolated titles saw a return of a Canadian price listings, including While the Clock Ticked (1979), The Flickering Torch Mystery (1979), The Hardy Boys and Nancy Drew Meet Dracula (1979), The Secret Warning (1990), and the Viking Symbol / Chinese Junk 2-in-1 omnibus edition published in 1995! (as seen here). Armada paperbacks were also distributed in the Republic of Ireland (Eire) and some printings also featured a price for that particular territory. Armada published all 56 of the Collins and all 25 of the Angus & Robertson hardback editions in paperback. 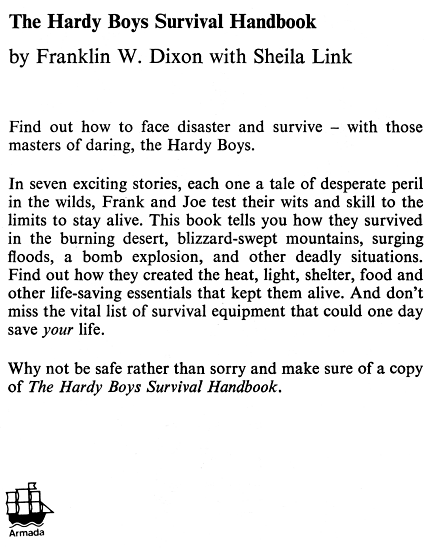 There are, however, 87 paperback titles in total: this is because Armada also published Sky Sabotage (#77), The Roaring River Mystery (#78), The Mystery of the Silver Star (#84), Programme For Destruction (#85), The Sky Blue Frame (#86), and Danger On The Diamond (#87), none of which had been released in hardback in the UK. 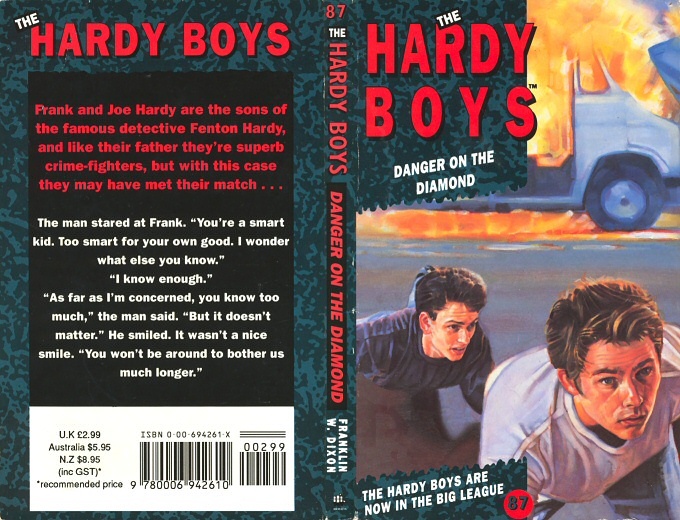 Danger on the Diamond was actually the 90th Hardy Boys book in the US; the reason for the numerical anomaly between the US numbering and the UK numbering is because three titles, The House on the Cliff, The Hidden Harbour Mystery and Tricky Business were not published in hardback or paperback by either Collins or Armada. The last new Armada title of the regular series was published in 1992. No further new titles were published after Danger on the Diamond, although reprints were issued for another three years, right up until the imprint itself was killed-off by Collins. However, the series continued on in the States for many more years, until 2005 when the 190th and last title, Motocross Madness, was published – many of these later Digest paperbacks were imported into the UK after Armada's demise (A partial list of imported US editions can be found in Appendix V: Imported Editions). 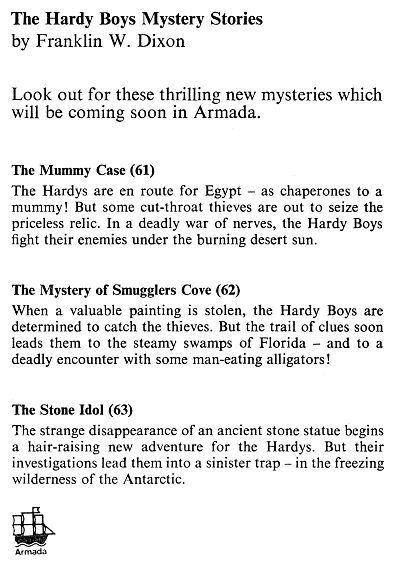 In addition to the 87 titles from the original series, Armada published several other Hardy Boys editions (many of which were cross-over affairs featuring Nancy Drew), including the first 12 titles from the Casefiles series, the entire Be-A-Detective mini-series and four other miscellaneous titles. The specific details of the Casefiles paperbacks are covered in their own page. During their tenure, Armada Books were responsible for the publication of many different omnibus volumes. The reasoning behind the omnibuses was purely a logistical (and financial!) way of clearing out surplus stocks of unsold books. Surplus paperbacks would be stripped of their covers, and then glued together with a new binding – et volia, a new book! These editions, usually containing either two or three stories from the original series, were released by a variety of Collins imprints in addition to Armada, such as: Fontana, Mulberry, Dragon and Diamond. 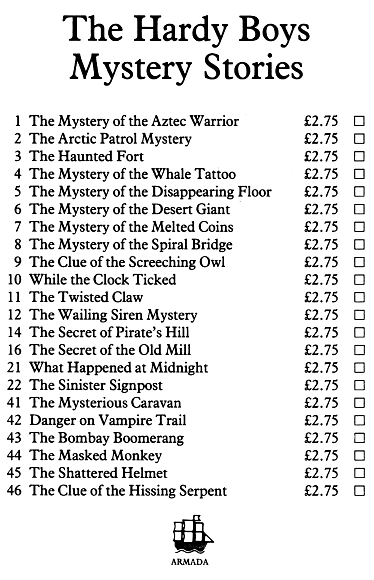 The particular titles featured in any given compendium were apparently chosen on either a sequential or purely random basis. Formats D, E, F & Other Titles.